Ed George played college football at Wake Forest University. At 6-foot-5, 270 pounds, he was known for his ferocity and determination. He was a fourth round draft pick of the NFL’s Pittsburgh Steelers in 1970 but opted to come north and join the Montreal Alouettes. He played both offense and defense during his five year tenure with Montreal. He was a four time All-Eastern and All-Canadian. He was Montreal’s nominee as Most Outstanding player from 1972 to 1974. In 1973, he was chosen as the top lineman in the Eastern Division. 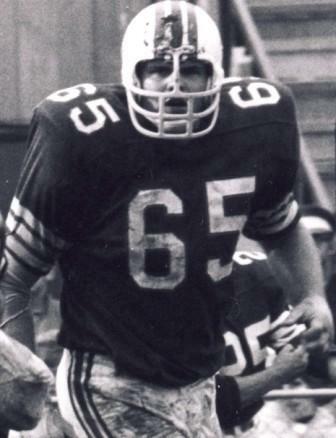 In 1974, he was the first winner of the Schenley Most Outstanding Offensive Lineman award. He became a free agent in 1975 and spent four seasons in the NFL before returning to Canada in 1978 with the Hamilton Tiger-Cats. Through two seasons with the Tiger-Cats he played 34 games and advanced to the 1980 grey cup game, the last game of a brilliant seven year career in the Canadian Football League.